I don't know how many squash courts there are in north Wales, though I hazard a guess that it's not a region flush with provision. The courts - dubbed the "Roll's Royce" of Flintshire's squash courts" are due to close in November to make way for a new youth club. "There is a lot of strong feeling down at the squash courts and I'm not the only dissenting voice by any means ... There are still questions that haven't been answered properly. "For example, could an alternative venue for the youth club not have been found. 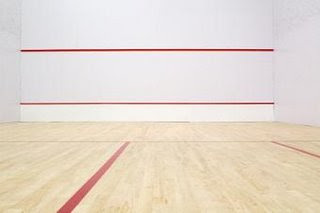 And if it has to be at the squash courts, why must we lose both? Can't we keep one court?" "A site within the Pavilion Leisure Centre in Flint has been identified as a suitable location for a new youth and community centre facility. This will require some alterations to the site, which include the conversion of the squash courts area to an activity hall. "Officers from the council's leisure services team will be working to accommodate the requirements of squash players at other facilities within the county." The website link below asks for comments on whether the courts should be saved. Have your say ... and click here to discuss on squashblog the possible closure of other courts around the country.